A carpentry tool the hammer face is used for driving nails and the opposing claw is used for withdrawing nails and other prising or levering work. On the right of the group of tools above is my Swedish made Estwing 26oz claw hammer. It has a one piece all steel head and shaft. The shaft is wrapped in a firm rubber type of hand grip. 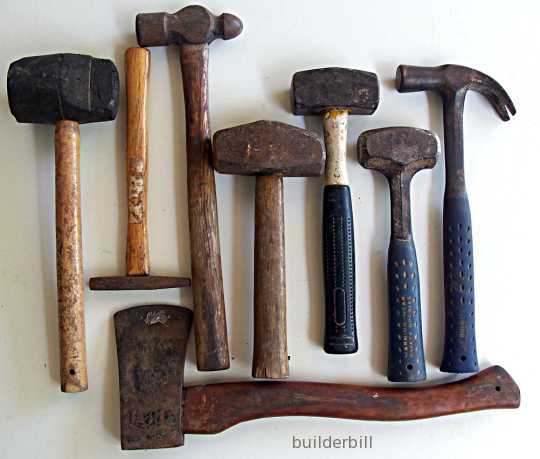 These types of hammers come in various weights and handle styles. The quality varies enormously from maker to maker. From a personal point of view, having started with wooden handled American Plumb hammers, and having owned fibreglass handled Plumbs, steel shafted Stanley's and a range of other, including leather handled Estwings, this is my one and only choice. It is the second one I have owned having had my first one stolen. The combination of balance and strength is unbeatable. Note! The leather handled Estwings are a good tool but living in the tropics they do tend to dry out eventually and maybe sweat gets at them, so that the leather rings deteriorate. A tool that I have never used, is the US framing hammer. It is heavier and has a longer shaft the delivers more power when driving long nails. I have heard good reports of this from my American friends.